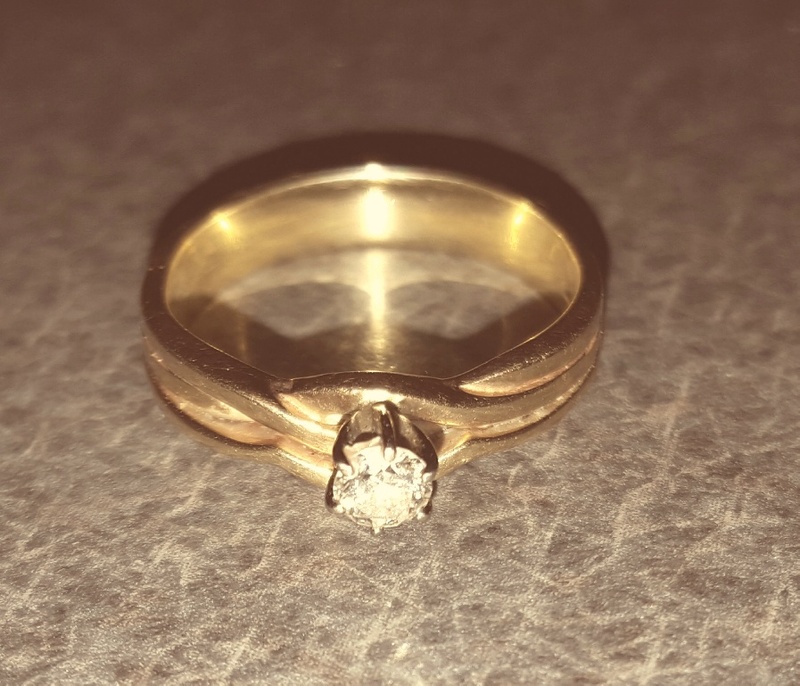 Our wedding anniversary is just around the corner and because I haven’t had my wedding ring looked at for a very long time – well I thought tonight was the night to get that done. See I haven’t worn it for quite awhile because I was worried that maybe the prongs were bad or something. Who knows? – but I knew that I wanted someone to check it out before something bad would happen to it! And because we live still not that far from where it was purchased, I thought how fun it would be to go back to that jewelry store again. So after work that was my mission. I was going to see if the same jewelers were there yet. With a big old grin on my face, I hopped out of the car and made my way across the street to the store. OK, this is going to be GREAT. Now I wasn’t sure why it was going to be so great – but I was just sure it was going to be! As I walked through the front door I was greeted by the women who helped me pick out my ring 35 years ago. And guess what? She still looked the same! A little older yes, but I recognized her. So as I stood in front of her when she asked if she could help me, I proceeded to tell her that I got my wedding ring from them 35 years ago and wanted someone to check it out. She just kind of looked at me funny and I thought it was because she was trying to remember me or something – but I soon realized it was because I had a big old goofy grin on my face! And if that wasn’t bad enough before I could stop myself I found that the words just spilling out of my mouth again was that I got my ring there 35 years ago. So she just kind of smiled (to be honest I think I was scaring her!) and we made our way back to her husband and said that I got my ring from them 35 years ago, then hesitated, turned and looked at me, kind of nodded her head, and then asked her husband if he would want to check it over for me. Well he was busy with a watch repair and had the whole thing gutted on the counter in front of him, so he wasn’t as impressed as I was that I was back in the original jewelry store and talking to the same original people again. Shazam right? Well he took the ring, and in less than 5 seconds he looked over his glasses and asked if I had ever worn it. What? OK, maybe I just take good care of my stuff right? Then he said (again while he was looking over his glasses) it looked perfect and he went back to his business again with hardly missing a beat. The wife smiled at me and said it sounds like your ring is good and that was that. Now I don’t know if I expected balloons to be dropped down from the ceiling and maybe an announcer there to say that I had come back to the same store again to visit the same people that we did 35 years ago, but seriously maybe a huge welcome banner or a horn going off wouldn’t have been that much to ask now would it? I wanted to snap a quick picture of them while I was in there, but for some reason I didn’t think that would have been the best idea. Just saying. Oh well, it sounds like I’m good for another 35 years! 3 Responses to Blast from the past! How fun for you to even be living in the same area where you originally bought your ring!! Too bad they didn’t stop to recognize you as an old customer, at least!! If you don’t wear your ring in bed (the sheets really wear down the prongs), then the prongs last longer. I had to have my diamond re-pronged when I was having trouble even seeing them at the edge of the diamond. They were really flattened out. Was that the jeweler in St Lucas? That’s a very good guess – but it was Wilshires in New Hampton.